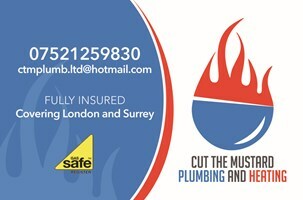 CTM Plumb Ltd - Central Heating Engineer, Plumber based in Mitcham, Surrey. We are CTM Plumb Ltd. here to help with Pro-active, Efficient Repairs To Your Central Heating Systems along with all Plumbing issues from full bathroom suite installations to leaky taps and faulty toilets. We are proud and confident to offer 7 years of experienced problem solving. We are fully insured and Gas Safe Registered(ID will be shown on arrival). Call Us. Make an Enquiry. Expert Team. Expert Services. 24/7 Phone Support. Free Estimates.